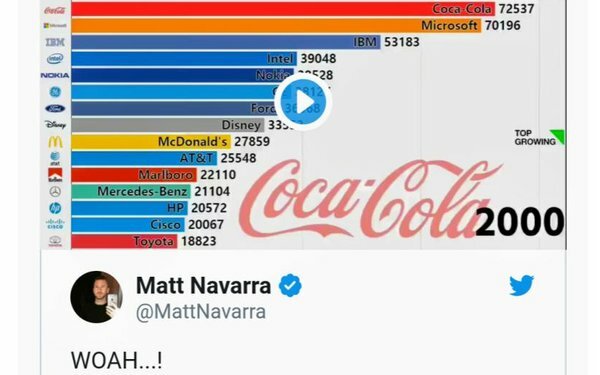 British social media consultant Matt Navarra got some attention recently when he tweeted an animated, time-lapse visualization of the top brands' value changing in real-time over a 19 year period. The visualization was a powerful reminder about the value of looking at longitudinal change, but it also sparked a debate on Twitter about the underlying values the data represent. The data in the visualization came from Omnicom's Interbrand unit's annual "Best Global Brands" study, which utilizes a proprietary method to calculate "how your brand is contributing to business growth today." According to Interbrand's methodology statement, it factors three major criteria -- financial, role of brand, and brand strength -- using a combination of "internal" and "external" factors. The concept is not unique, and others have methods for assigning brand value to bottom lines, but what made Navarra's tweet so striking was the way it was visualized. It's one thing to look at brand value shifting periodically over time, but when it's time compressed, it creates an emotional dynamic that alters the way we perceive the value of the data. Just watch how tech giants Apple and Google overtake the brand value of Coca-Cola, IBM and Microsoft in minutes vs. decades, and you'll get the idea. In a world of virtually infinite data, how it is represented, and especially, how we communicate it with each other, is becoming as, if not more important than the underlying data itself. Yes, there are times when data is empirical knowledge, representing the explicit value of things -- Nielsen ratings, currency markets, etc. -- but oftentimes, it is the way we perceive and process the data as human beings that frames its value for us. In a world of advanced AI processing, I don't necessarily think this is a bad thing. I think it's still important for humans to assign emotional values even to the most scientifically processed data, because data is just a guidepost for human judgement. Even if humans are assigning those outcomes to machines to process. 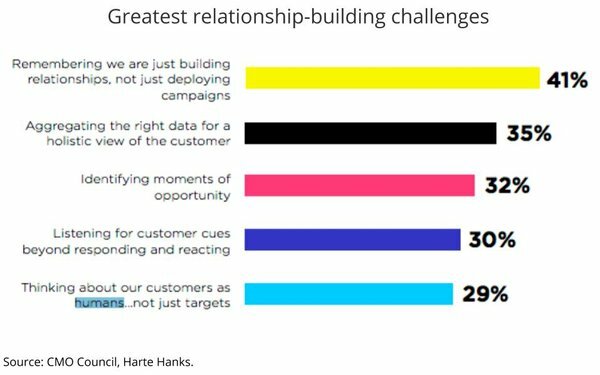 Last week, I reported on the findings of a new report published by the CMO Council and Harte Hanks, which found that most marketers feel they are doing only an okay job at best of listening to the behavioral signals of their human customers. Worst of all, the report, entitled "Bringing A Human Voice To Customer Choice," also found that a significant number of senior marketing executives (29%) are having a hard time thinking of their customers as "humans" instead of "targets." 1 comment about "How To Be Human". Dan Greenberg from Impossible Software, GmbH, March 5, 2019 at 9:57 a.m. Humans evolved in a world where trends are more important than accuracy. Knowing if something is precisely a lion, tiger, jaguar, or leapard is a lot less important than knowing if a generic "large thing that can eat me" is moving toward or away. Rapidly, those who focused on precision were removed from the gene pool. In human factors (to emphasize your point - "human") and UI design, you often see a tradeoff beween digital and analog. When you're on deadline, the sweep of the hands of a clock is a whole lot more compelling than a digital readout of 4:59. In a car, a tachometer is (or should always be) analog. And do on. The animation of brand value works for that reason. As a human, you see the trends in the line lengths and they motivate attention... just as if you saw a large cat moving around the savannah. To a large extent, you barely see the numbers, can't discern how they're changing, and don't care because focussing on one number defeats your innate bias to be watching the whole.